Williamstown was first settled in 1749. No further information on this system has been found. The Williamstown Water Company was chartered on March 27, 1847 by Daniel N. Dewey, Seymour Whitman, and Edward Lazell and modified on May 9, 1848. No evidence has been found that this company built a water system. The Williams Aqueduct Company was organized in 1860 and built a water system. Another Williamstown Water Company was chartered in 1885 by Albert C. Houghton, James M. Waterman, Calvin B. Cook, William B. Clark, and Sidney S. Edwards. A law passed in 1889 allowed this company to buy the Williams Aqueduct Company. This charter was also modified in 1909. The Town of Williamstown bought the system on April 1, 1942 and currently provides water to the community. 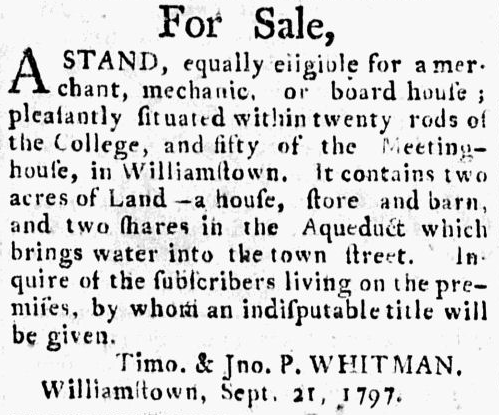 1796 An act to incorporate Lemuel Stewart & others for the purpose of conveying water by pipes into the town street near the college in Williamstown, by the name of the Proprietors of the Water Works in the Town Street in Williamstown. February 26, 1796. 1847 An act to incorporate the Williamstown Water Company. March 27, 1847. 1848 An act in addition to "An act to incorporate the Williamstown Water Company." May 9, 1848. 1882 Williamstown, from "The Water-Supply of Certain Cities and Towns of the United States," by Walter G. Elliot, C. E., Ph. D.
1885 An act to incorporate the Williamstown Water Company. June 30, 1885. 1888 "Williamstown," from Manual of American Water Works, Volume 1. 1890 "Williamstown," from Manual of American Water Works, Volume 2. 1891 "Williamstown," from Manual of American Water Works, Volume 3. 1897 "Williamstown," from Manual of American Water Works, Volume 4. 1889 An act to authorize the Williamstown Water Company to take by purchase or otherwise the franchise and property of the Williams Aqueduct Company. March 29, 1889. Page 194: Attention was called to what has ever since been named the "College Spring." A straight path led to this, also directly south from East College. About the middle of the century an hydraulic ram was set in this spring, and the water thrown up to the East College level. A couple of decades later an aqueduct company brought water from the "Cold Spring" to the village residences and near to the college buildings. In 1881 the aqueduct water was introduced into the West College and into most of the other college edifices, both the older and newer ones. 1909 An act relative to the Williamstown Water Company. June 1, 1909.